This figurine is part of Deb's Party collection commemorating their 30th year in business! This is the perfect gift for anyone celebrating a birthday or anniversary. 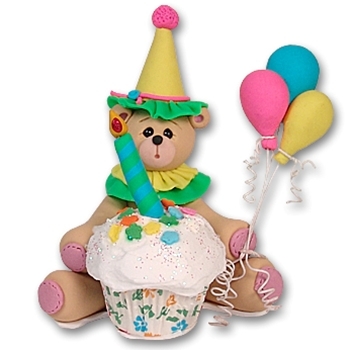 Binkey the Belly Bear is featured with his own personal cupcake with one simple candle and a bouquet of balloons. The cupcake is sprinkled with a bit of glitter for that special sparkle. It may be easily personalized with a name, year or event on the balloons and hat As always personalization is FREE! The ornament is lovingly handcrafted from polymer clay and designed by Debi Allison. This is a 3 dimensional, free standing figurine. There is NO hook for hanging.